Do you love seeing live bands? New York City ad exec Nick Sonderup sure does, so much so that he's pursuing a "crazy" goal he set for himself: to see 100 bands in 100 nights. So far, he's on his 34th group, and he's shows no signs of stopping. Writing in his blog, Sonderup says that he "used to go out and see a lot of music, and I used to write about a lot of music. Sadly, I don't do either that often anymore. I had to change that. And what better place than NYC?" Sonderup set a timetable for himself: from 23 January to 2 May he would go on a "self-induced, binge-gigging marathon." Even in a music-crammed city like New York, Sonderup admits his plan isn't so simple, but he says, "I want to put myself through something like this to see if I can do it. I don't have the endurance or will to run a real marathon, but I think I could pull off a music marathon. "4 February. [On this date, Sonderup is seeing The Heartless Bastards, at Maxwell's in Hoboken, New Jersey.] The 100 bands in 100 days project has reached a new milestone: first band outside of NY. Ok, it was just across the river in Hoboken, NJ. But that's reason enough for me to celebrate with the biggest slice of pizza known to man from Benny Tudino's. And sure, Benny's is also on the way from the PATH station to Maxwell's. But whatever, I'm still calling this a celebratory slice." "Week #4: What I've Learned So Far. Farting at shows: People fart at shows. This isn't a trend alert. In fact, this has to stop. I'm sure people have been doing for years. But I've just noticed it from going to show after show after show for the last month. Seriously people. Stop dropping bombs. We're already crammed in there like sardines." And as of two days ago, Sonderup was dragging. "23 February. I'm tired, worn out, congested, waaaaaaaaa…It took 31 days for this project to beat me down. I gotta take better care of myself. This project is hard enough as it is - I don't need to be sick on top of it." 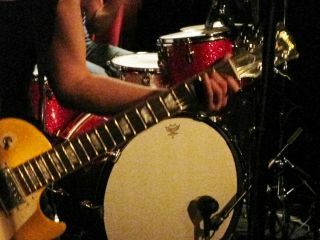 Today, however, Sonderup sounded rejuvinated and ready to see band #34, The Subjects, at the Bowery Ballroom. Of the acts he's seen so far, Sonderup says he didn't like Mother/Father very much ("I just didn't get them") but he raves about The Rural Alberta Advantage and Lambchop ("both blew me away big-time!"). Thus far, Sonderup is down $469 for money spent on tickets, CDs, plus beer and food. The total would be higher had he not been the recipient of $421 in donations. "I thank everyone who's put money into my cause," he says. "I really appreciate everybody who's shown interest." And if you want to donate, you can do so on Sonderup's website, 100 Bands in 100 Days. Who knows? The next band he sees could be yours.